The nights are getting longer as the darkness of the Autumn Season is settling in. Tonight's Full Blood Moon takes place in the fiery sign of Aries. Aries is an active and energetic sign exuding confidence and needing expression. This week the past may be stirred up as the full moon is currently squaring Pluto, which could cause some old unhealed wounds to come back to the surface to be re-examined and healed. Venus and Mars is conjunct in Virgo today, an occurrence that hasn't been seen since 2015. This could mean some major cycles in your relationship are ending, and a sense of balance is being restored or healed in your life. These are pretty intense and dynamic times. The recent events in America, paired with the full moon energy may be causing conflicted and intense emotions within many. Especially if you are an empath. The cycle presented to us on the last new moon was one of healing. And while the term healing often makes us think of rest and relaxation, this full moon is asking us to take action towards that healing. Our card pulled for this cycle was the "Create" card, which seems fitting for our current energy. There is a lot of energy wanting to get moving and it is needing to be expressed in some way. Tonight's Full Moon ceremony taps into the creative energy. Mandala making is a very powerful creative meditation. It not only helps you slow down and sooth your mind, but it can show you powerful truths about yourself. You can even set an intention before beginning a mandala to help further intensify the energy behind it. The Major Arcana cards of the Spirit de la Lune deck feature Mandalas. Mandalas contain images, colors and symbols to help spark your intuition or sooth your soul. The motion of creating in a circle is very natural and soothing to us as the circular shape is inherently harmonious. The cards are meant to unlock your intuition and spark insight, but creating your own mandala can be also helpful for your own soul's healing. You do not have to be a good artist to create a mandala! Mandalas are a sacred space, most often a simple circle that reveals inner truth about you and the world around you. Follow the simple steps below to create your very own Moondala! The first part of this ceremony includes a reading to gather insight and information for your moondala. Organize your Spirit de la Lune deck (or which ever deck you are using), separate the Moondala cards from the phase cards and pull a reading of 3-5 cards using the major arcana cards, and one card from the Minor Arcana. I chose 3 moondalas and 1 Phase card for this ceremony. 3 Moondalas full of symbols, colors and images for inspiration, and 1 phase card for the overall central theme. Don't worry too much about a spread. For this ceremony we are just looking at the symbols, colors and themes that stand out the most to you. Looking at the cards in front of you, see if you can find an overall theme or lesson for your mandala. Begin to notice elements from each of the cards. Look at the small details, the shapes, petals, or symbols within the card. Take notice of the colors you see as well, and how it makes you feel. Set aside these cards for inspiration for your mandala. You can take elements of each of these mandalas and combine them into your very own Moondala. There are many many ways to make a mandala. This is the process that I used to create the Moondala cards in Spirit de la Lune. It's simple, fun and meditative. 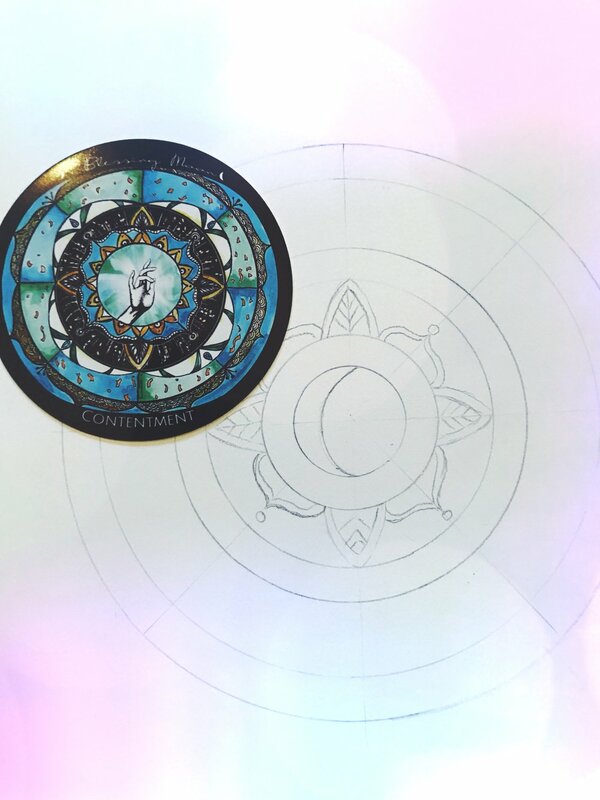 You can set an intention before you begin creating your mandala, but you do NOT have to know what your moondala will look like before you begin. In fact, I rarely ever do. This is expression, don't plan it out or think about it too much. 1. Trace the outer circle. You can use a small dinner plate, or a bowl to help create your outer circle. 2. Find the center of your circle using a ruler. Make a small dot right in the center for your reference point. 3. From the center of the circle, begin to trace your other circles, working your way from small to large. Be sure each circle is centered. Using tape rings, or lids is helpful so you can see where the center is at. For variation in your Moondala, stagger the spacing of the rings. 4. Take your ruler, and draw a light line through the center of the circle, and segment it out a few times. I divided mine into 8 sections. You can do as many or as little as you would like! The more segments - the more detailed your mandala will be. 5. Add your center symbol. The image in the center of the mandala often represents the overall theme of a mandala. Look back over your cards and find the symbol you want to use for your theme and center point. I chose to use the phase card that I pulled as the center of the Mandala. You can add any element you would like from your reading to the center. 6. Now is the time to set your intention as you draw some of the shapes found in the cards. You may helpful insights as you begin creating and filling in the designs on your mandala. Using your other cards, begin to fill in the "bullseye/grid" with elements from your cards that you feel speak the most to you. Many of the cards have simple shapes, like triangles, circles or half circles/petals. Use the guides and the grid to help keep your mandala centered and balanced as you fill in your details. Don't worry about perfection! I'm sure that if you look too closely at the cards, you'll find many imperfections. That's often the beauty of creating. Allow yourself to feel into the flow of creating. Let things come to you. If you want to add something to your mandala that isn't from your cards, go for it! As you work on your mandala, remember to work in a circle. Start from the center and work your way towards the edges. Rotate your page, or physically move around it. Let yourself feel that circular energy as your focus goes within and around the circle you are creating. Mandalas will draw you inward as you work on them. The are innately introspective shapes. Allow yourself to get lost in the shapes you are drawing. Ask yourself why you chose to draw petals, or stars. Ask yourself what the meaning behind this mandala may be. Once you have the drawing of your mandala done, it's time to add color! I chose to paint mine with watercolor since that's my favorite medium and what I originally did the deck in. Choose whatever medium you feel most comfortable with. Colored pencil, or marker would look great! Take time to work from the center out again. And be mindful of your color choice. Work with the colors from your reading if you can't think of what colors to use. Ask yourself why you are drawn to the colors you are. Colors also hold many meanings! The final step is to line your final Moondala in pen. I use Micron art pens, but any pen would work! This is the final step that give it that completed Moondala Feel. This is a good time to fill in any last minute details or embellishments on your mandala. The black lining really helps things pop and stand out. When your Moondala is complete, set up a crystal grid over it and set it under the Full Moon to activate it. You can hang your moondala in your home, use it as an altar piece, or do what Tibetan monks do with their completed mandalas- destroy them. But I prefer to keep mine. Mandalas are a meditative art form, and can take quite a bit of time if you choose to do a large one. We would LOVE to see any mandalas you create with us tonight on this Full Moon in Aries. Such a wonderful time to tap into our creative gifts and express some of these intense emotions we are feeling! Sign up with your email address to receive monthly New Moon energy reports, Full Moon Ceremonies, news and updates.